(TibetanReview.net, Mar17’16) – As the Tibetan electoral tryst with their Sikyong destiny draws near, Home Kalon (Minister) Ms Dolma Gyari has on Mar 12 thrown her lot behind incumbent Sikyong Lobsang Sangay. The Charter of the Tibetan in Exile allows a person to serve as Sikyong for two consecutive terms and she felt that Lobsang Sangay needed his second term to complete his first term initiatives. Earlier, on Feb 28, the Department of Information and International Relations Kalon Ms Dicki Chhoyang resigned from her post in order to be able to speak freely on the election. She explained that the election rules did not allow serving kalons to influence the electoral process. She later declared her support for Speaker Penpa Tsering as the next Sikyong. The Sikyong is the executive head of the Central Tibetan Administration at Dharamshala, India, and is the freely elected political leader of the Tibetan people. The final voting takes place on Mar 20, along with the voting for the Tibetan Parliament-in-Exile. 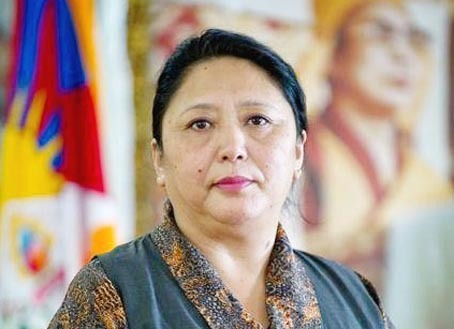 Ms Dolma Gyari has announced her support for Lobsang Sangay while speaking on the sideline of an election speech being given by the later at the Tibetan Institute of Performing Arts, Dharamshala. The Tibetan election commission has, controversially, limited the current Sikyong election to just two candidates, both supporters of the middle way approach of seeking autonomy for Tibet under Chinese rule as proposed by Tibet’s exiled spiritual leader, the Dalai Lama. Left out of the race is Mr Lukar Jam Atsok, who won the third highest number of votes during the preliminary poll held in Oct 2015 and who stands for campaigning for Tibet’s independence from Chinese rule. The remaining two candidates, who won less number of votes than him in the preliminary poll, also supported the middle way goal; they too are out of race in the final poll.